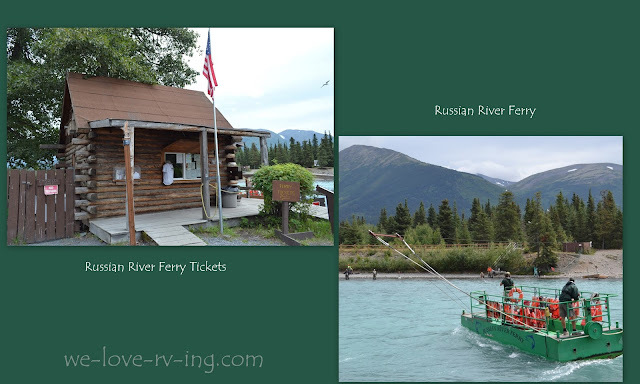 Our tour of Denali Park and its many beautiful sights and wildlife. Denali National Park and Preserve in Alaska was where we hoped we’d see lots of wildlife and Mt. McKinley, too. Now known as Mt. Denali, which means “the High One”, it is the highest peak in North America and stands 6193 metres (20,320‘) high. We booked our tour before we arrived, as it is so popular that it could be difficult if not done early. The only way to visit inside Denali Park during summer months is to take a bus tour, they just could not handle the traffic it would be should everyone take their vehicles. We stopped to watch a wolf walk by the bus. Considering there are over 6 million acres and less that 50 wolves living in this Park, it was amazing that we would see this great guy. He was alone and was not too concerned about the bus. We remained very quiet and took photos out the window. Grizzlies are most easily recognized by the hump on their shoulders but the colors can vary. Some look almost blond and others dark brown. They are all free to wander this magnificent park of tundra, spruce forest and glaciers. 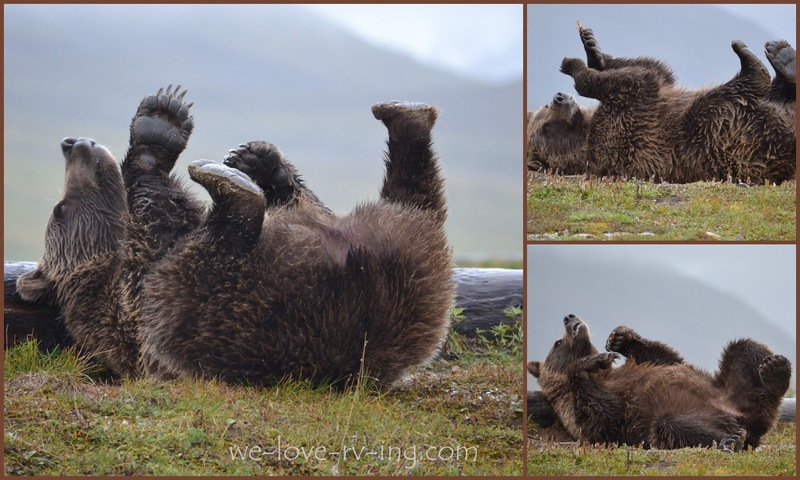 The park is home to caribou, moose, Dall sheep, bears, wolves and grizzly bears but some days you may not see as many as we were lucky enough to see on our tour. I don’t believe there were any black bear sightings but the grizzly bears more than made up for that, we saw many of those bears. Our bus driver was the tour guide and had lots of interesting information to share. We had a bus full of visitors and everyone watched for sights and passed the info onto others. The driver said there was more sightings on our tour than there had been for a long time, we had some good scouts with us! 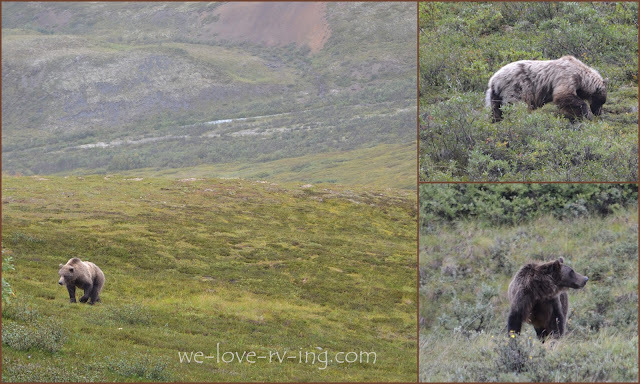 Dall Sheep were spotted way up that mountain, not easy to see other than there was a group of white four legged animals! We’d seen this same sight on our visit to Kenai Peninsula, but they’d seemed even farther away. We did see a couple of moose but, although it was not far off the road, this one was hidden in the bushes. The other was too far away and in bushes, to get a good photo. The day was wet and dreary, which made the sightseeing a bit difficult travelling dirt roads, causing muddy windows for us to look through. There were a couple of pit stops along the way and the driver would wash the windows at each stop. The old school bus style windows could slide down half way and that was done if we were stopped to see some wildlife. We stopped to watch one grizzly who, although he was paying no attention to us, seemed to know we were there and was performing for all to see. He would rough up the log then lie down and rub against it. I took over 70 photos while he enjoyed his backscratching, he was there for several minutes. He was up and down a few times, and we were all taking as many photos as possible. The grizzly was not 20 ft. from the roadside, what a thrill to be able to watch him. 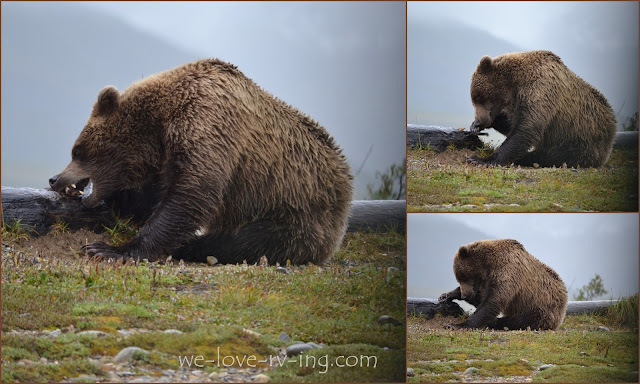 I think I can say that this grizzly was the star of all the wildlife we saw on our northern adventure travels. We were so close, yet stayed quiet in the bus and did not disturb him, so were able to get these amazing photos. This day was not a good day for viewing Mt. McKinlay which has, since our visit been officially renamed Mt. Denali. We were at the Eielson Visitor Center, which was as far as our tour would be taking us, but this was all we saw of the highest peak of North America and not visible most days of the year. For more information about this incredible Denali National Park and Reserve in Alaska, click here. There are hiking trails for backpackers and lots more to enjoy. Click here to follow us across the Denali Highway.